Working together with Fulton County School Board and gaining the Board's unanimous support our North Fulton Republican Legislative Team passed an assessment freeze which will appear on the General election ballot -- vote "YES" to set you assessment at the lowest amount of the past three years and avoid the increase in future years. Super fun and an honor to read with the Pre-K students last week during 2018 Pre-K Week! Such great examples of energy and positivity! Click link above to see learn more about Georgia Pre-K and Voices of Georgia's Children. Property owners in Fulton County should have received your 2018 Annual Notice of Assessment by now. Like many of you, I was quite surprised, even shocked, by the enormous jump in my property value. To save our homeowners from these increases, earlier this year during Legislative Session, we passed bills that will provide solutions, those solutions require a vote in November and by law cannot apply to this year’s taxes. More on those solutions later – first to provide information to understand and appeal 2018 Assessment Notices. Click the link at the top of this article or click here to go to a larger article on the Fulton County Assessor Resource pages. To go directly to Online Appeal, click here. While we will get to vote longer term homestead exemptions this November this article provides a background and basic information on appealing your 2018 property taxes -- please check back as detailed steps to appeal are on the way. The Georgia Primary Election is Tuesday, May 22, 2018; this includes the Special Election for Alpharetta Mayor and two City Council Posts. Early voting ends Friday May 18th; please don't miss your chance to vote. I would be honored to have your support and ask for your vote, early or on election day! Tax Savings on the Way to the November Ballot! 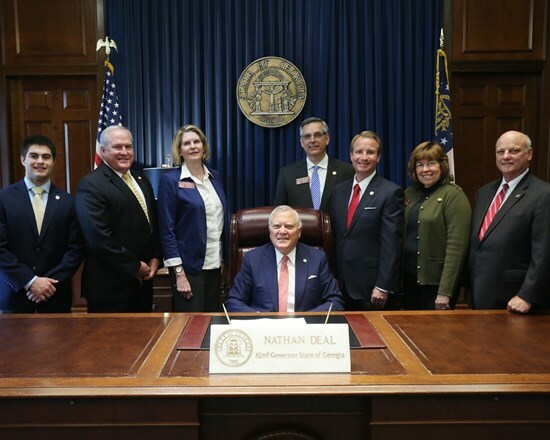 Today Governor Deal signed HB 707, HB 708, HB 709, HB 711, HB 712, and SB 317. Senator John Albers (from right), R - Roswell, Rep. Chuck Martin, R - Alpharetta, House Speaker Pro-Tempore Jan Jones, R - Milton, and Senator Fran Millar, R - Atlanta, at a press conference Tuesday on the final passage of legislation addressing Fulton County tax exemptions. A number of homestead exemptions that passed for North Fulton and the schools will let people improve their homes without losing the lower assessed value. “A priority of mine is protecting taxpaying constituents and creating and passing these measures protect my constituents from unpredictable and unaffordable property tax bills due to reassessments. Work had been ongoing since last summer and I was pleased and relieved when the bills passed and were sent to the Governor for signature,” said Representative Chuck Martin. Monday, January 8th, marked the beginning of the 2018 Legislative Session in Atlanta.